As far as dining out goes we have the cyber diners, those among us who obsessively watch social media, hoping to be the first to get a taste of the latest new restaurant opening. There are the traditionalists who are entirely committed to a favourite restaurant, spending every special occasion meal there, from birthdays to date nights and all family gatherings. Then there are the increasing numbers of destination diners, serious food lovers who think nothing of travelling overnight just for a meal — throwing a toothbrush in a bag and driving across the country for dinner at the latest ‘hot’ chef’s restaurant, no matter how obscure the location. Now, more than ever before, there is culinary life beyond the city’s borders… and then some. Not only are the splendid restaurants surrounding us in the west worth the drive from town, many have become true gastronomic adventures in their own right. We have no shortage of places worth a jaunt too, from the Michelin starred Wild Honey Inn in Lisdoonvarna, to the homely Hungry Monk in Cong, to family friendly café Rua in Castlebar and the ever reliable Moran’s on the Weir. Even food trucks are getting in on the act, Misunderstood Heron is always on our list for a visit when passing by Killary Harbour. Little Fox is a new cafe that is definitely worth setting up the sat nav for, and is very exciting news for Ennistymon. Opened by Niamh Fox on August 2, it aims to be a perfect balance between hearty comfort food and decadent dining. Since moving to County Clare to start a farm and family with her furniture designer and knife maker husband Sam Gleeson of ‘Thisiswhatido’, the duo combined talents creating a thriving smallholding, growing enough to eat and share, keeping pigs, and hosting visitors in various long table dinner evenings. 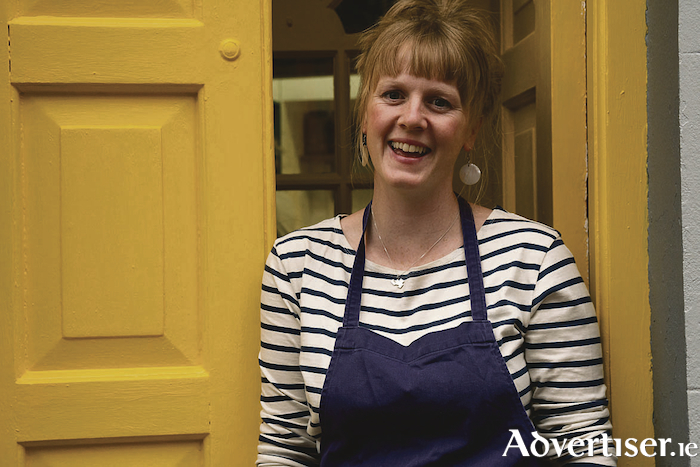 Educated and trained at GMIT, Niamh Fox started her love affair with food at the age of 17, working with Denis Cotter of Cafe Paradiso in Cork and the inimitable Margot Henderson of Rochelle Canteen, London, as well as Jess Murphy in Kai and Ted Burner in Ballymaloe. Sam Gleeson’s work has graced the likes of the Fumbally café and Stables and The National Gallery as well as supplying knife commissions to well known UK chef Nathan Outlaw. In Niamh’s kitchen you will find pure, simple, and clever flavour combinations, as she brings her wholehearted cooking to this picturesque market town in County Clare. Here they intend to serve locally grown food, intertwined with the natural rhythm of the seasons, cooked with heart and flair. This charming restaurant is a culmination of Niamh’s many years of kitchen experiences and Sam’s innovative passion for design. Little Fox will champion seasonal local produce and hopes soon to be a zero-waste business. The menu highlights include west Clare pollock, mussels, and potato stew with ramson aioli and crusty sourdough; and a stuffed French toast with mascarpone and rhubarb with an almond crunch. Moy Hill farm salad of beetroot, hummus, bitter greens, whipped St Tolas goats curd, hazelnut dukkah, and spiced tandoor flatbreads will also feature. Little Fox is open from 8am for breakfast and lunch daily with brunch served on Saturdays and Sundays from 10am to 5pm. They also hope to host a dinner night once a week. To see what is happening follow on Instagram @LittleFox_Ennistymon, check out what’s on the menu at www.littlefox.ie, or simply make the trek to Main Street, Ennistymon, to visit its new landmark. It has all the ingredients that worthwhile culinary pilgrimages are made from. Little Fox café, Main Street, Ennistymon, Co Clare. Tel: 087 466 4382.